The official stillmotion App, for iPhone and iPod Touch. Tutorials, gear picks and advice from a leader in photography, videography and production. Build your own catalogue of beautiful design while browsing the offerings of Poliform. Developed with Kadamari Baxi. Tri-Alpha is an educational app inviting viewers to play with the alphabet in three languages: English, Greek and Hindi. Use the dynamic parallel interface to see multilingual letters with sounds, enter words in the text field in English and learn the closest matching glyphs in Greek and Hindi. Triptych: Tri-Alpha is available now directly from the iTunes App Store. Marine Defenders was made in collaboration with Common Good Productions. Marine Defenders is an educational program designed to reduce chronic oil pollution. Download the Marine Defender app to report and map oil pollution and marine debris. 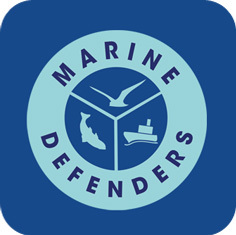 More information can be found at the Marine Defenders Mobile Reporting Site. Building Beat was created for the NYC BigApps Competition. Try out the Interactive Prototypes. 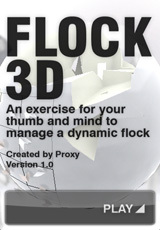 Flock 3D is a "spatial exercise", challenging you to manage a dynamic flock. The flock is a living system of agents that respond to each other as well as the iPhone "touch" interface. Push the swarm around, steer them away from the bombs and keep as many of them alive to achieve maximum flock survival. The action takes place in a fully realized 3D environment, where the spectacular 3D abilities of the iPhone/iPod are foregrounded. Flock 3D is an elegant and simple game that you can play over and over again - an exercise that challenges your mind as well as your thumb. 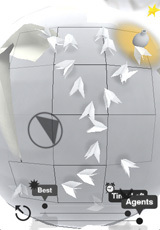 Flock: A 3D Game is available now directly from the iTunes App Store. Fully realized 3D graphics with OpenGL acceleration - see what your iPhone/iPod is capable of! Intuitive controls using the touch interface - touch the screen and see the flock react. 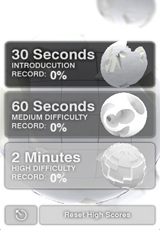 Three game play modes of increasing difficulty, each with a unique 3D environment. Touch-controlled camera lets you track down agents and bombs in a sprawling environment. Training mode that walks you through controls and objectives. Intelligent agent behavior, based on Craig Reynold's steering behaviors. Scoring system - keep track of your best scores. Flock 3D is developed by Proxy, a design firm that works with computation and space. Proxy explores artificial intelligence and generative systems in a variety of platforms, including architecture and software development. Proxy is implementing a series of apps around the themes of dynamics, gaming, spatial tagging/mapping and distributed intelligence. Flock 3D is the first to hit the App Store. These applications spring from Proxy's research in algorithmic form and real-time computation. More information can be found at the Search HD Vimeo Page as well as the Proxy Homepage.